Sometimes, you stumble upon a wonderful mother figure, and you don't even realize it. I met the artist Barbara Friedman in New York in 1987, when we took a creative writing workshop together at the New School. Even though she was only a few years older than I was, Barbara was loving and maternal, and always called me "sweetie." Barbara was already married when we met, and I thought she had the most interesting life: She lived in a loft downtown, she taught art at Pace University and her husband was studying to be a philosophy professor. She was a gifted artist and would invite me to her shows. I was a twentysomething journalist and pretty much broke. I couldn't afford to do more than gaze at the postcards she sent out of her work, and then wander around the New York galleries where her work was being shown, filled with awe and yearning. Flash forward 24 years. Barbara has two daughters, she's a tenured art professor at Pace and her paintings have become extraordinary. Her work sold out at the recent Visual Arts Center of New Jersey event in Summit, where she sold 14 large oil paintings in 24 hours. Her paintings are filled with light. They draw you in and calm you down. Then they lift you up and and fill you with wonder. I can't stop staring at them. Barbara and Roger Sayre are showing their work in a three-day show called "From Our Permanent Collection. " The show opens tonight at the Big & Small/Casual Gallery in Long Island City, near PSI. 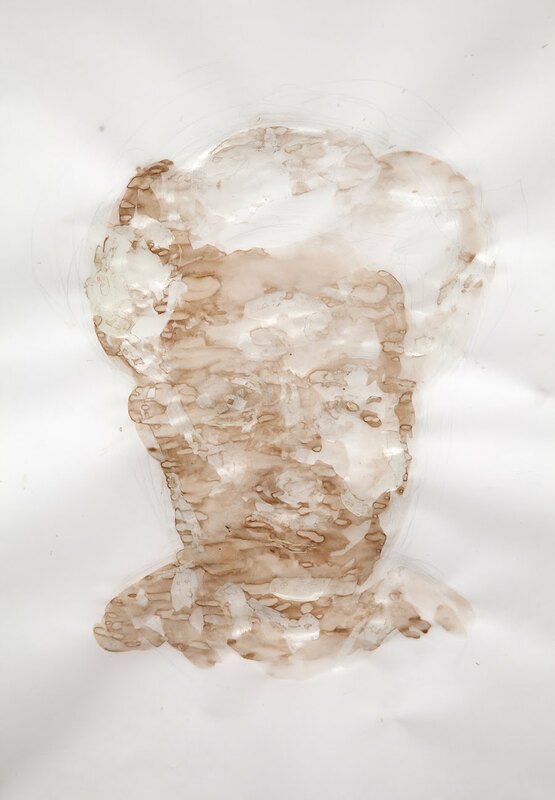 The reception is from 5-8 p.m.
Much of Barbara's new work, "Head Grid," focuses on her mother, who passed away last summer as she was approaching her 100th birthday. 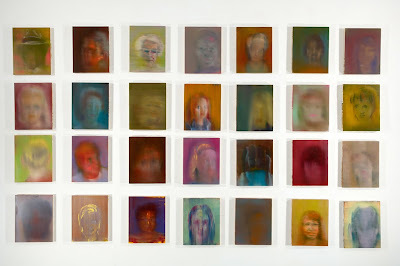 Barbara's explanation of what prompted her to paint the series of small paintings that make up "Head Grid" is below. Her work makes a wonderful gift. Happy Mother's Day. Head Grid started with a small painting of my mother. As she aged, my mother slowly lost her eyesight to macular degeneration, and it felt natural to make my portrait of her correspond to the way she saw faces: recognizable but also slipping away; impossible to focus on. I ended up producing an entire wall-full of faces as I thought they might have appeared to her. The general effect is similar to an effect I pursued in earlier paintings, in which a superior viewpoint at a distance promises to let you see everything even while making it hard to see anything. (You overlook the vista, meaning that you take it all in; but also overlook it in the sense of missing it.) And analogously, in these Head Grid paintings, zeroing in on a face threatens to make it unrecognizable. Scrutiny goes together with incompleteness of vision. While I was working on these paintings my mother died, a few months before she would have turned 100. The drawings in this show are my last images of her, like a record of the last one percent of her life. But for these pieces I focused not on how the world came in through her eyes but how it impinged on her skin, now thin as paper. I used ink and masking fluid on vellum, knowing that the process of working with these materials would make the vellum’s translucent surface bruise and buckle as her skin had been doing.